Two unfinished cellars are explored at Narttamalai during our field trip to Vijayalaya Choleeswaram.1 Both the cellars are just few yards south of Pazhiyili Iswaram, lying in a distance of 105 feet beyond. Though we had been to the place for many times, we didn’t think of moving beyond Pazhiyili Iswaram where these two cellars lie inconspicuous behind the overgrown shrubs and bushes. 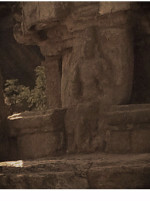 Both the cellars are typical Pazhiyili Iswaram style of attempt; a cellar with anterior wall having kapota and side walls.1 Apart from Pazhiyili Iswaram to its north lies the Pathinenbhumi vinnagaram, a huge mandapa cave. Both the cellars are excavated at the foot on the eastern precipice, on the ledge of the hillock. 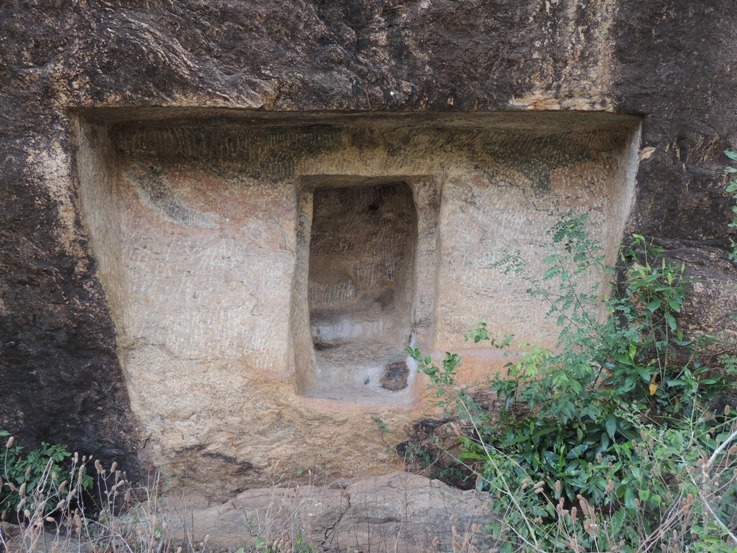 The mother rock is continuously inclined in this region starting from Pathinenbhumi vinnagaram which extend even far beyond the unfinished cellars. In this inclined precipice the two cellars are excavated facing east. Nearly 40 feet distance is seen between the cellars. The Cellar I is at the extreme south and Cellar II lies to the north of Cellar I. 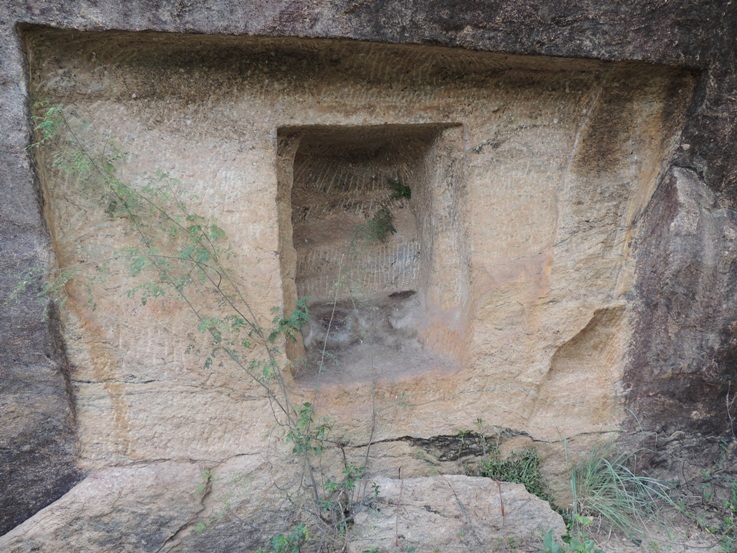 On the eastern face of the hillock to a width of 2.95mts and to the height of 2.45mts the mother rock is sheared off which gives a well formed anterior wall with kapota and side walls to the cellar. The anterior wall is broad in the top and gradually becomes narrow in the base. The rough rock brow forms the kapota that extends 0.60mts and the canopy is flat. The side walls range between 0.50 mts to 0.10mts due to inclination of mother rock. An attempt of uttira is seen. At the center of the sheared off wall an aperture is formed to a height of 1.28 mts, width of 1.05mts and to a depth of 0.85mts. Aslike, the Cellar II also has a well formed anterior wall to the height of 2.62mts and to the width of 3mts. likewise, the anterior wall is broad in the top and gradually become narrow towards the base. The kapota is 0.85mts and the side walls range between 0.85 mts in the top gradually becoming 0mts at the base. Attempt of uttira is seen on the southern corner. The cell is scoped in the centre to a height of 1.32 mts, width 1mts and depth 0.83mts. Jambs and sill are formed in the opening. Among the two, the Unfinished Cellar II is well formed. Smaller caves are quite common in Pudukkottai district, the cellar shrine Kulalakottaiyur2 and the mandapa cave Mangudi are best examples. 1. Date of the trip 10-02-2016. It was first cited by Seetharaman Subramanian while he was moving towards south to get a better view of Vijayalaya Chooleswaram. 2. The anterior wall of Pazhiyili Iswaram is 2.38mts height and 4.21mts width. The aperture to the sanctum is 1.70mts height and 0.94mts width. The sanctum is 2.30mts height, width and depth. 3. The anterior wall is 1.42 mts height, 2.06mts breadth. Aperture to the cell is 1.39 mts and width 0.08mts. The sanctum is 1.70mts x 1.21 mts x 1.41mts.